The 2007 FIFA Women's World Cup, the fifth edition of the FIFA Women's World Cup, was an international association football competition for women held in China from 10 to 30 September 2007. Originally, China was to host the 2003 edition, but the outbreak of SARS in that country forced that event to be moved to the United States. 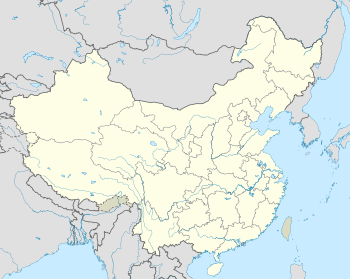 FIFA immediately granted the 2007 event to China, which meant that no new host nation was chosen competitively until the voting was held for the 2011 Women's World Cup. The tournament opened with a record-breaking match in Shanghai, as Germany beat Argentina 11–0 to register the biggest win and the highest scoring match in Women's World Cup history. The tournament ended with Germany defeating Brazil 2–0 in the final, having never surrendered a goal in the entire tournament. The Germans became the first national team in FIFA Women's World Cup history to retain their title. For a list of all players that participated in the final tournament, see 2007 FIFA Women's World Cup squads. For a list of the international referees that officiated at the 2007 tournament, see 2007 FIFA Women's World Cup officials. The group draw took place on 22 April 2007 in Wuhan after the completion of the qualifying rounds. FIFA automatically seeded the host and defending champions, slotting China and Germany into Group D and Group A, respectively. The FIFA Women's World Ranking for March 2007 was used to determine the teams to occupy the other seeded positions, B1 and C1. United States were ranked first, Germany second and Norway third, so the United States and Norway were also seeded. Also, no two teams from the same confederation could draw each other, except for those from UEFA, where a maximum of two teams from UEFA could be drawn into the same group. Group B quickly became dubbed the group of death since three of the top five teams in the world were drawn in this group — the USA (1st), Sweden (3rd) and Korea DPR (5th), according to the June 2007 FIFA Women's World Rankings, the last to be released before the tournament. The same four teams were drawn together in Group A in the 2003 FIFA Women's World Cup, on that occasion the USA and Sweden progressed to the knockout stages. Also in 2015 The United States and Sweden would meet in the group of death again. This time it was with Nigeria and Australia as group mates. The four teams were also paired in the same group in 2003. Numerous TV stations across the world provide coverage of the tournament. One notable example is the Chinese-language channel CCTV-5 which is available as a free internet feed through TVUnetworks. UEFA used the FIFA Women's World Cup as its qualifying tournament for the 2008 Olympic women's tournament. The best three performing UEFA teams will qualify for the Olympics. Originally it was thought that, should England make the top three European teams, they would compete under the United Kingdom banner. However, on 6 September 2007, FIFA issued a press release indicating that England are ineligible to participate in the 2008 Olympics as England does not have its own Olympic Committee. For the determination of the ranking only first through fourth place, quarterfinal elimination or group phase elimination count. If there is a need to make a distinction between teams eliminated in the quarterfinal or between teams eliminated in the group phase these teams will meet in a play-off match. In no case will the points or goals (difference) count for teams eliminated before the semi-final. Germany and Norway qualified for the Olympics at the World Cup, whereas Denmark and Sweden had to enter a play-off for the third Olympics spot. Sweden won both legs of the playoffs with a total of 7−3 on aggregate to qualify for the Olympics. ^ "Wuhan promises Final Draw drama". FIFA.com. 17 January 2003. ^ FIFA Women's World Ranking March 2007 Retrieved on 16 September 2007. ^ a b Hays, Graham (23 April 2007). "U.S. women face Group of Death scenario again". ESPNsoccernet. Archived from the original on 25 May 2011. Retrieved 17 December 2009. ^ "Three European teams will book their spot to Beijing 2008". FIFA Women's World Cup China 2007. FIFA. 6 September 2007. Archived from the original on 1 October 2007. Retrieved 3 October 2007. This page was last edited on 11 April 2019, at 13:52 (UTC).